Oriental Insurance Company is a general insurance company completely owned by the Government of India. Oriental Insurance Company has insurance solutions for every needs of Indians and has a large network of offices and employees – more than 900 offices and 15,000 employees across India. Oriental two wheeler insurance is a financial safeguard for a large variety of situations. Two wheeler insurance becomes one of the most important purchases you’ll make. Oriental two wheeler insurance take care of all damages caused due to natural disaster such as an earthquake or flood; or somebody damages or steals your two wheeler. Oriental two wheeler Insurance understand the needs and offer Comprehensive Motor Insurance products that provide the added protection for your vehicle. Oriental two wheeler Insurance further provides cover for liability, death or property damage of third parties. 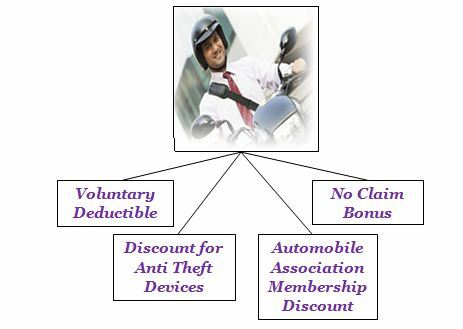 No claim bonus is available ranging from 20-50% depending on the number of claim free years. 5 % Discount for Automobile Association Members. Discount based on age and profession. Discount for Anti Theft Devices. Comprehensive support through our dedicated customer support team. Online renewal process of policy is available. Legal protection for damage to third-party property. Personal Accident Benefits for you. Protection for your legal liability to driver. For more information regarding Tax Benefits, visit www.taxqueries.in. Personal Accidents to owner‐driver whilst driving the vehicle including mounting into/ dismounting from or travelling in the insured vehicle. Personal Accident cover can be given to passengers of the two wheeler on a named or unnamed basis. by charging additional premium of Rs. 500/- per vehicle in case of package policy and Rs.100/- per vehicle in case of Liability only Policy. No Claim Bonus – If no claim is preferred in the expiring Policy, a Bonus or Discount named NO CLAIM BONUS is given on the Premium of the new Policy. Discount for Anti Theft Devices –A discount of 2.5% on the OD component of premium subject to a maximum of Rs. 500/‐ for the Device approved by the ARAI. 1. Endorsement for nil depreciation: An excess of 1% of admissible claim amount or 0.5% of the IDV of the vehicle whichever is less subject to a minimum of Rs.250 will be deducted from the claim at the time of settlement in addition to any other excess / deductibles applicable under the policy. 2. Personal effects endorsement: The payment of any claim under this endorsement shall be made only if loss is reported to the Police Authorities and a FIR/DDR registered. General Wear & Tear, Depreciation. A voluntary excess (If opted). Damage to your personal property and opted TP Liability option. Costs and expenses incurred without the prior written consent of the company. Damage by a person driving without a valid driving license. Damage by a person driving under the influence of Liquor/Alcohol/Drugs. Loss /Damage attributable to War /Mutiny /Nuclear risks. Damage to tyres/tubes of the two wheeler, unless damage to the vehicle in the accident with liability maximum fifty percent of value. Damage, outside India unless covered by extra premium for Nepal, Bhutan & Bangladesh, Pakistan, Sri Lanka & Maldives. Immediate Notice shall be given to the company in writing upon occurrence of accidental loss/Damage. Submit all the documents required by the insurance company. Insurance company has the right to inspect the claim at any point. The company decides for repairs, reinstate or replace the vehicle insured based upon the accident. Through Oriental two wheeler Insurance premium Calculator we can calculate the annual premium based on depreciation value and IDV value given. Oriental two wheeler Insurance premium Calculator gives you approx amount to be paid during buying new policy and renewing the old policy depending upon the details you have given. Log on to official website: http://www.orientalinsurance.org.in/. Enter Policy number and proceed. The Geographical area can be extended upto some selected countries. Apart from general inclusions other discounts are available. Online renewal process is available. Online buying option is provided. 24×7 customer service is available through toll-free.